From March 1802 to 18 May 1803, Europe was at peace, the longest peace during the Napoleonic era. The Bessieres’ would be married for eleven and a half years, until Jean’s death in battle in May 1813, yet even this 15 month peace would not allow him to be home with his bride. 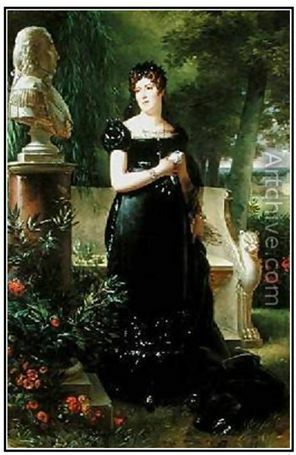 Though, Napoleon had wanted Jean to marry his sister Caroline Bonaparte he was quite happy with Jean’s choice. Jean and Marie were a perfect match. Marie (the name she went by instead of her first name Adele) was very beautiful and with the same strong character, charm and manner of her husband. The couple was a great social success everywhere they went. Marie became a close friend and confidant of Josephine. This friendship drew the Bonaparte and Bessieres families even closer together. When Napoleon divorced Josephine, it made the friendship difficult at times, yet true to their character and sense of fidelity, Jean and Marie never wavered in their affections and loyalty to both Napoleon and Josephine. The War of the Third Coalition would last until 1806, to be followed by the Fourth, Fifth, and finally the Sixth Coalition War. 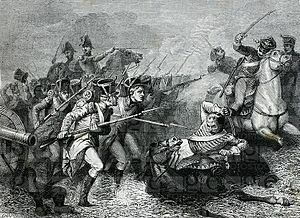 It was during the War of the Sixth Coalition that Marshall Bessieres was killed followed two years later by the final defeat of Napoleon at the battle of Waterloo. Napoleon said, “If I had had Bessieres at Waterloo, my Guard would have brought me victory,” this point has been argued by historians. I am not sure if Waterloo could have been a French victory, even with Bessieres at the battle. What do I believe? If Bessieres had been at the battle of Waterloo, even if the French had been defeated, it would not have been the rout that destroyed the French army. The French may have lost, but Bessieres’ unbiased advice on the battlefield would have allowed Napoleon to conduct an orderly retreat that would have preserved the French army and Napoleon’s throne. But, I am getting ahead of myself. In 1803, the War of the Third Coalition began between Great Britain and France. Napoleon’s actions in Italy and the execution of the Duke d’ Enghien (which Bessieres was against) brought Austria and Russia into the war in 1804-05. 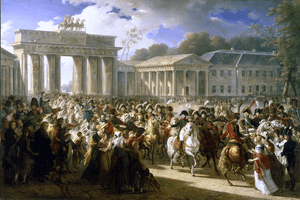 In the Ulm campaign (August to October 1805), an entire Austrian army was captured. 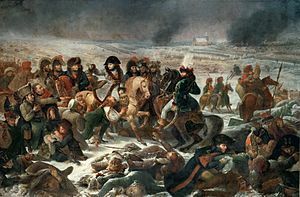 Then came the battle of Austerlitz in December, outnumbered by the Russian and Austrian allies, Napoleon soundly defeated the allies effectively ending the Third War of the Coalition. Once again, the friends Murat and Bessieres were in the thick of the fighting, helping to win the day for France. The War of the Fourth Coalition happened without a period of intervening peace. The Fourth Coalition was basically the Third Coalition without Austria and the addition of Prussia. This was to continue for the rest of Bessieres’ life and continue after his death until the final defeat of Napoleon at Waterloo. Jena, Auerstedt, Eylau, Friedland, Somosierra, Corunna, Aspern-Essling, all of these and more would see the victorious and dashing friends Murat and Bessieres working hard for French victory. At Elyau the Austrians technically defeated Napoleon, but they let him get away with his army. Partly because Bessieres led the Imperial Guard in a frontal assault against the main Austrian attack force at a vital point in the battle. Not once but several times Bessieres led his men in a suicidal attack. The last year and a half of Bessieres’ life was spent constantly in battle. It is miraculous that Bessieres did not die earlier than he did. At this time in the Napoleonic Wars, the allies were getting better because of experience from the earlier defeats, and the French were slowly losing their best and most experienced men through combat deaths. Bessieres was the first to recommend they leave Russia, even before they arrived at Moscow. In Moscow, the French found the city burning and deserted by the Tsar and his army. Bessieres took his own food from his own table and gave it to hungry Muscovites and Russian children. On the retreat from Russia in October 1812, 6,000 Cossacks surrounded Napoleon’s headquarters on three sides. Without concern for his own safety (as Bessieres always was in battle) he led a charge of the Imperial Guard, running off the Cossacks, killing thousands of Cossacks, and rescuing Napoleon. The morning of Bessieres’ death, he told an aid he was eating breakfast because if the enemy got him that day he did not want to die on an empty stomach. Sixteen years of war and eighteen months of continuous battle were taking a great effect on the great Marshall. Apparently, he was beginning to believe own combat death was inevitable, that can be dangerous for any person in combat. But, who could he confide in? His wife was thousands of miles away for much of their married life and all of 1812 and 1813, Napoleon and his men not only counted on his calm, cool, courage in battle; they depended on. If Bessieres showed his fear it could have been disastrous for the Imperial Guard. There was no one Bessieres could turn to for comfort, so Bessieres took a mistress. Not what you would have expected considering his reputation and the deep love he had for his wife. However, even in this one vice, Bessieres’ character was above that of the men and women of his day. Affairs were common in this day, even Napoleon and Josephine both had a long lists of lovers. Bessieres though did not follow the norm of inviting woman after woman into his tent. Bessieres took one mistress, for whom he paid all of her bills. An expense his contemporaries all avoided by going through lover after lover. 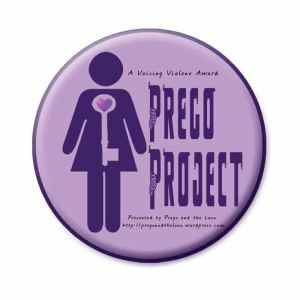 Even in his one vice, there was a certain amount of honor. At the battle of Borodino (7 Sep 1812) the Russians and French were both decimated, but there was no clear-cut winner. Napoleon is criticized for not committing his reserve to bring about a victory. All of Napoleon’s Marshalls wanted to commit the reserves except Marshall Bessieres. Bessieres did not argue the point, he made one simple statement to Napoleon, “But, Sire, you are 700 leagues (2,100 miles) from Paris.” If Napoleon would have used the reserve and not destroyed the Russian army, he would have had a French army that was worse than decimated, deep inside an enemy country facing an enemy army thousands of miles from home. Bessieres was correct and Napoleon knew it. Bessieres is criticized by historians as a capable commander, but a failure as an independent commander due to his conservative nature. I would like to point out though, that when historians look at a battle they are looking at that one battle with the knowledge of how it and all the following battles ended. They also tend to look at each battle as an isolated affair. Bessieres’ advice and actions were always tempered by the knowledge that he did not know what would come tomorrow and the knowledge that if the army was utterly destroyed, France’s enemies would own the streets of Paris (which they eventually did). historians should read the diaries and memoirs of the aides of both Bessieres and Lannes who witnessed this whole affair. A good place to start is with the memoirs of General Marbot. General Marbot was one of the men ordered by Lannes to deliver Lannes’ orders to Bessieres. Marbot had no doubt that Lannes’ purpose was to insult and humiliate Bessieres. Marbot states that there was no doubt of this at the headquarters of Lannes and Bessieres. He goes on to describe the scene when he gave the orders to Marshall Bessieres. I have already printed the letter Napoleon wrote to the Duchess Bessieres on the occasion of the Duke’s death. When Marshall Jean Baptiste Bessieres, Duke of Istria died he left huge debt. Napoleon created a pension for the great general’s widow to insure she was taken care of. In his book, Travels in France during the years 1814-1815, Archibald Alison wrote of spotting General Blucher leaving his apartments in Paris (which Blucher rarely did). Alison followed the General to the church of the Invalides, where he went to a grotto in the church where the body of Bessieres lay in state surrounded by flowers his widow brought to the church daily for her husband, this was two years after his death. General Blucher paid his respects to his former adversary (Bessieres beat Blucher in 3 out of 4 battles they faced each other in) and then left. The Bust of Jean Baptiste Bessieres, Duke of Istria, Marshall of France. 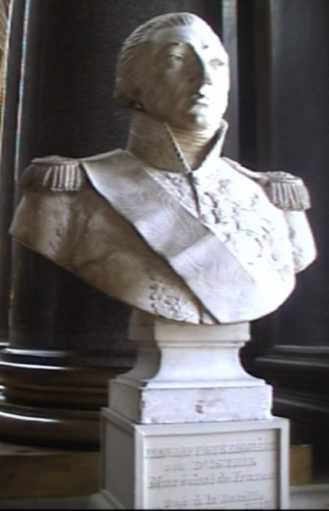 This bust is just inside the hall of Heros in Paris to the right of the entrance. There are so many more instances that I am prepared to give to demonstrate the greatness of this simple man. A simple man who loved his country, his friends, his family, and his wife. However, I will leave you with the words of Napoleon as he neared his own death in exile. 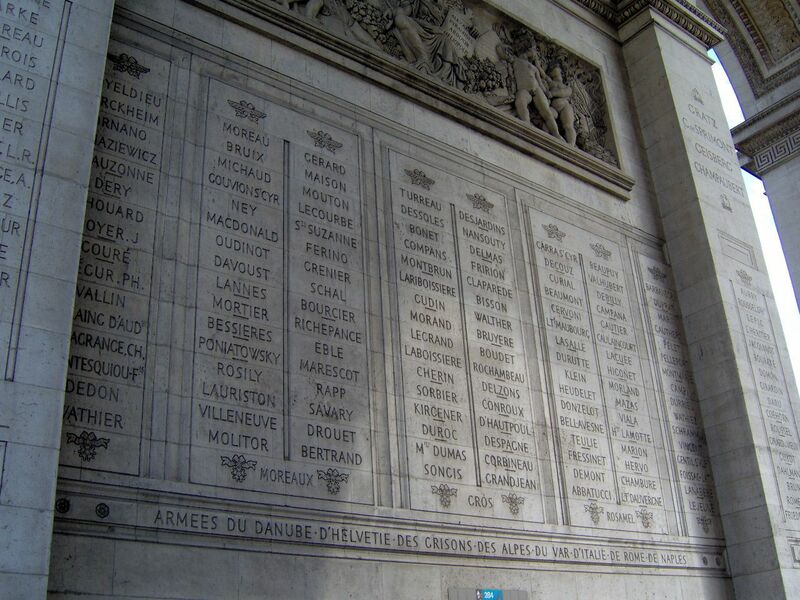 Jean Baptiste Bessieres’ name is on the east wall of the Arch De Triumph. Second col. from the left third stone up from the bottom. The line under his name denotes he was killed in action. His younger brother is on the South wall without the line because his brother survived the wars.